Providing you the best range of dual lane full height turnstile, tripod turnstile, security tripod turnstile, ss full height turnstile, electro mechanical full height turnstile and single lane full height turnstile with effective & timely delivery. 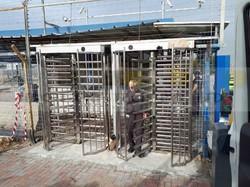 BGI Engitech manufactures most secure Dual Lane Full Height Turnstiles. These dual lane full height turnstiles are ideal to secure the passage where the high volume of people passing through, especially mega-events. BGI's Dual Lane Full Height turnstiles can be customized to meet client's all access control needs. Powder Coated: The powder if electro-statically applied, exterior tubing then baked to assure proper curing and adhesion the color of choice(according to)is available. Bio-metric Integration, Card Readers, Metal Detection, Push Button and wireless remotes, Manual key override both directions, Indicator Lights, Electronic/LCD Counters. The unit remains locked or unlocked during power fail mode. 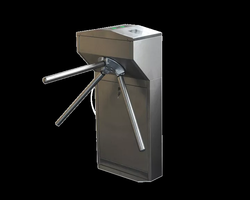 All turnstile models are space efficient security barriers, with a compact design, yet offer sufficient space to integrate any access control system. They can be mounted with a display, passage counter, card reader, token operation, traffic lights, command console, alarm system against unauthorized entries, interfaced with a PC through an RS232 line. The unique Bi-Directional Tripod with dropping arm feature provides a fail-safe safety solution in case of an emergency or power failure, providing egress in case of crisis evacuations. When power is down, the solenoid closes the magnetic energization and the drop arm falls down. Now when the power comes back the solenoid is automatically reset and the system is ready for operation again. Housing: Made in the metal sheet and painted with 20/lO, or in stainless steel AISI 304 to AISI316. BGI Engitech manufactures a complete range of SS Full Height Turnstiles. BGI Turnstile series is designed to provide quick entrance to authorized employees and visitors while maintaining aesthetics of the surrounding. Our turnstiles engineered to meet the most demanding access control needs, these turnstiles can be integrated with leading-edge technology and features as well as function independently. We are offering Electro Mechanical Full Height Turnstile to our client. BGI Engitech manufactures hi-quality Single Lane Full Height Turnstile. 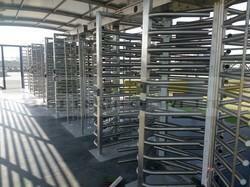 Our Single Lane Full Height Turnstiles are fast, reliable, durable, easy to install and provide hassle-free operation.